Since its introduction, Pearl's E-Pro Live has redefined how electronic drum sets should look, sound, and, more importantly, how they should FEEL. The secret of the E-Pro's FEEL is its Tru-Trac Electronic Drumheads that have the same size and response as real heads which allows drummers to transition from acoustic to electronic drums with absolutely no alteration to their playing style. The Tru-Trac Electronic Bass Drumhead is mounted to a real drum head and has the same “give” and FEEL of a real bass drum. With Tru-Trac Electronic Drumheads, the FEEL is just like playing real drums; no more playing on those small size pads! Pearl's Tru-Trac Electronic Drumheads are available in pre-packs and individual components so you can convert your own acoustic kit into an electronic kit. Both pre-packs include (5) No Drill Adapters and all necessary parts and tools to complete your kit's conversion from acoustic to electronic. Connect the pads to your favorite module, hi-hat controller and cymbals to enhance your current electronic kit, and you're good to go! 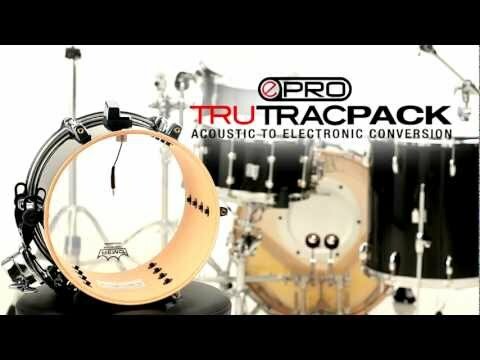 With Pearl's Tru-Trac Acoustic to Electronic Conversion Kits...it's As Simple as Changing a Drum Head.